About three years ago came news that a new photo of Billy the Kid might have been unearthed. Experts hired by National Geographic purported that the tintype showed Billy and a number of his associates on John Tunstall’s ranch in Lincoln County, New Mexico playing croquet. You can see the full photo and learn more at National Geographic’s site. The detail below supposedly shows Billy on the left with Tom O’Folliard in the center pointing at him. On the right may be Sallie Chisum. I love this photo on many levels. If this is Billy the Kid, we now have an image of him wearing a cardigan and a bow tie, playing croquet with his gang. Tom O’Folliard was Billy’s best friend. Like Billy, O’Folliard was shot and killed by Pat Garrett. Sallie Chisum was the niece of prominent rancher John Chisum, who in turn was a business partner of Billy and Tom’s boss John Tunstall. Sallie Chisum lived in Lincoln County until her death in 1934. To put that date in perspective, my mom, the daughter of New Mexico homesteaders, would have been seven years old. Sallie Chisum is important to historians because her diary contains stories about both Billy the Kid and Pat Garrett. Historians have been debating whether or not this photo actually shows Billy the Kid, the Regulators, and their associates. 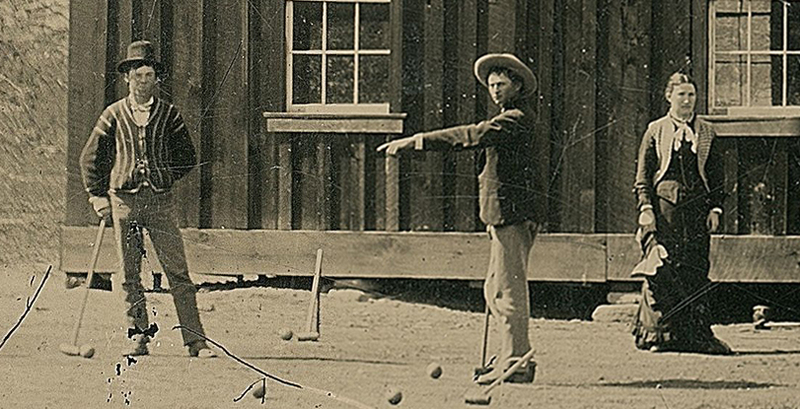 Whether or not Billy the Kid is in this photo, we do see a scene of people in the Old West playing croquet. We know croquet sets were sold in New Mexico because Gazette of Las Vegas, New Mexico ran an ad featuring croquet sets in 1878. In my Clockwork Legion novels, I have a character named Billy McCarty. When pressed, I tell people Billy may or may not be Billy the Kid. In many ways, he’s like the person in the photo, who also may or may not be Billy the Kid. I’m not a historian, but a fiction writer. As a fiction writer, I’m allowed to ask, what if this photo really depicts the Billy of my stories. What if his boss, Englishman John Tunstall, introduced him and his friends to croquet? What if he was an aficionado of the game? I play with this idea in my latest novel, Owl Riders. In the novel, Ramon Morales first encounters Billy teaching the men who work at Onofre Cisneros’s warehouse in Nogales how to play croquet. As the novel progresses, we find that Billy has skills with a croquet ball and mallet that rival his skills with a six-gun. On Saturday, I mentioned that I’ll be signing my vampire books at Boutique du Vampyre in New Orleans. This will also be the formal debut event for Owl Riders. You might wonder if that means that there are vampires in my new steampunk novel, especially in light of my Billy encountering vampires in last year’s Straight Outta Tombstone. In fact, there are no vampires in the new novel, but Boutique du Vampyre is in the same block of the French Quarter where Ramon and Fatemeh Morales live in the novel. Saddle up and take flight with the Owl Riders! Marshal Larissa Seaton is a character who appears in my novel The Brazen Shark from the Clockwork Legion steampunk series. She also appears in some of my short stories set in the same universe, including the story “Fountains of Blood” which will be in the upcoming Straight Outta Tombstone anthology. In my world, President Rutherford B. Hayes appoints her to be a U.S. Marshal after her work recovering a lightning gun from Curly Bill Bresnahan in the novel Lightning Wolves. It’s a fair question to look back at history and ask whether it’s realistic to imagine a woman marshal in 1877. As it turns out, Larissa of my fictional world was only appointed marshal seven years before it happened in real life. In 1884, John Couzins was appointed marshal for the Eastern district of Missouri and he appointed his daughter Phoebe as one of his deputies. When John Couzins was killed in 1887, President Grover Cleveland appointed Phoebe interim marshal. However, she only held the position for two months before a man was appointed as her full-time replacement. Not only was Phoebe Couzins the first woman to become a U.S. Marshal, she was the first woman in the United States to get a law degree and the first woman to graduate from Washington University in St. Louis. 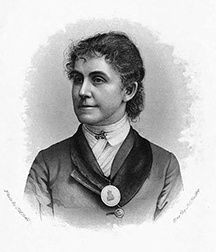 She was an early supporter of both women’s suffrage and the temperance movement. In later years, she actually renounced both and became an active lobbyist for the American Brewers Association. There were several notable women deputies marshals with longer careers. Perhaps the most famous was Ada Carnutt of Oklahoma. In 1893, she arrested nineteen men at the Black and Roger saloon in Oklahoma City for perjury. Shortly before Christmas that same year, she single-handedly arrested two forgers and escorted them to jail. The two heavily armed men supposedly scoffed at being arrested by an unarmed woman, but she pointed to the crowd around and told them she was willing to deputize every one of them to help her. Newspapers of the day noted that after the arrest she went back to her favorite hobby: china painting. Even before Ada Carnutt, Mrs. F.M. Miller was making a name for herself as a deputy marshal in Paris, Texas. 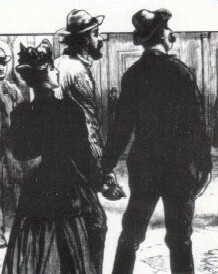 Unlike Ada Carnutt, Mrs. Miller had no problem carrying weapons. According to the November 6, 1891 issue of the Fort Smith Elevator, “The woman carries a pistol buckled around her and has a Winchester strapped to her saddle. She is an expert shot and a superb horsewoman, and brave to the verge of recklessness.” The article also noted that she was a “charming brunette” and wore a sombrero.